Suzuki Philippines Incorporated (SPH) zooms into 2016 with an upbeat outlook, as it announced today an overall robust 2015 performance, achieving its highest record sales of 10,000 units with 52 percent year-over-year sales growth, massive increase in visibility and market share, and aggressive network expansion, as well as bagging several awards for its vehicles. This cements the company’s position as one of Philippines’ best performing car brands in terms of YoY growth. Making the most of the rosy economy and booming automobile industry in the country, SPH flourished in the past fiscal year ending December 2015, driven by numerous car launches and inauguration of new dealerships. The brand inaugurated a total of 10 new dealerships last year. Suzuki Auto Pasig, Suzuki Auto East Avenue, Suzuki Auto Sucat, Suzuki Auto Isabela, and Suzuki Auto Naga are the latest addition to its 3S dealerships. To increase visibility in key areas where the target customers are, SPH also opened five satellite showrooms, in Chinatown, Legazpi, SM San Mateo, SM Masinag, and SM Taytay. The Philippine auto subsidiary likewise broke ground for two service and sales facilities at Sta. Rosa and Biñan, Laguna. Car launches further elevated SPH’s numbers. Last year saw the arrival of the much-awaited All-New Celerio, which hit it big in the market. The brand also rolled out updated versions of the Suzuki Swift 1.2, Swift Dzire and the sporty Swift Si. 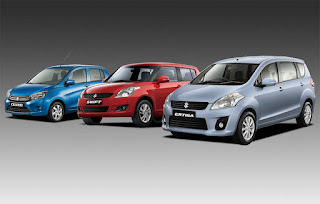 The seven-seater compact MPV Suzuki Ertiga has not been dislodged as the best-selling single model of the brand, pitching in 30 percent to the total 2015 sales figures of Suzuki Philippines. This powerful, cost-efficient car option for the whole family boasts of folding rear seats, which can easily accommodate large objects that cannot fit in a regular sedan. Meanwhile, almost half (46 percent) of total 2015 sales was contributed by the Subcompact and Mini Subcompact Category comprised of Suzuki Swift 1.2, Suzuki Celerio, and the Suzuki Alto. These models embody the Suzuki automotive philosophy: sleek and stylish, with powerful engines at the core. Innovative design and fuel-efficiency features also hike up the popularity of these mini cars. Suzuki Philippines expects to repeat or even outperform its impressive 2015 performance in 2016, with strategic marketing and sales activity implementations already in the pipeline. Numerous dealership inaugurations nationwide and new car launches are on its 2016 calendar as early as now, starting with the most-awaited debut of the all-new Suzuki sedan Ciaz.